Covering more than 14,600 square kilometers(5,863 square miles) or 1,460,000 hectares it has more animals and a greater variety of species -107- than any other park in the country, and more than 400 species of birds. Winter Months - Mid May, June, July, early August, although the days are warm with beautiful blue skies, the evenings can get extremely cold and temperatures below freezing are not uncommon, so definitely bring warm clothing. It's cold I promise you! Summer months - September through to May. Hot to extremely hot days and warm evenings. Rainy season - Generally between late November and April although the occasional rain can occur out of these dates. August, September, October and early November are by far the best months for game viewing in this park. 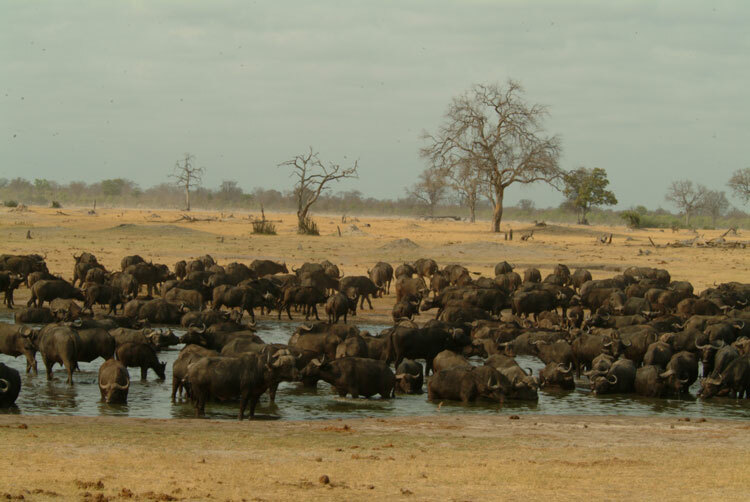 Water becomes extremely scarce and the animals congregate around the few pumped waterholes. Sitting patiently and quietly at one of these water holes will reward you with very good game viewing. During the rainy season from late November through to April, a completely different park emerges to that of the dry season. Parched savannahs turn into lush fields with an abundance of grazing. The animals disperse and game viewing becomes limited. It's called the green season and has it's own magic as this is when the park and all the animals rejuvenate themselves, feeding like crazy on the abundance of food. Newly born animals can be seen everywhere and the birdlife is absolutely prolific. It is situated in the south west of Zimbabwe between Bulawayo and Victoria Falls. There are two distinct geographic zones, neither are able to support viable agriculture. The flora of the well drained northern area, part of the Zambezi watershed, is dominated by mopane and mixed terminalia, which is distinctly different from the rest. Elsewhere the Kalahari scrublands, covered with stunted, scattered woodlands of teak and umtshibi trees, drain into Botswana's Makgadikgadi Depression. This habitat is characterised by marshy depressions, vleis and fragile open grasslands on shallow soils. In the nineteen century this land was the royal hunting reserve of Mzilikazi and his successor Lobengula. But the arrival of the first white hunters and settlers signalled the slaughter of its wildlife by the thousands. As their blood soaked deep into the sparse soils, it left empty, useless wasteland, denuded of wildlife, unfit for farming. 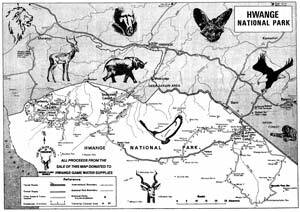 It was declared a game reserve in 1928 and with neighbouring Robins Game sanctuary, became a national park under he National Park Act of 1949. Originally, Robins Game sanctuary belonged to H G Robins, a cattle rancher. Because his herds were constantly under attack by lion and leopard, Robins turned the ranch into a wildlife preserve. Later in exchange for a new house and a water supply he gave the sanctuary to the government. When founding member Ted Davidson walked across virtually every square kilometre in 1928-29 he discovered the wildlife was almost non existent. The once teeming herds of elephant numbered fewer than 1000 and the rhinoceros, both black and white had been exterminated. Anyway, the poorly drained Kalahari sands, with their relatively low rainfall, were unable to support permanent large wildlife populations. The seasonal pans and fossil river lines held water all too briefly after the rains, and only occasionally did any large numbers migrate into the region. Davidson perceived that the water was the critical key and in the years that followed he drilled boreholes to create sixty new pans, linked to the seasonal pans that already existed. slowly the animals particularly the elephant and buffalo, began to move back. Close to half a century later, Hwange National Park faced another, different crisis - too many elephant. Their numbers had risen to more than 20 000 and in their wake the massive beasts left fallen trees and fragile, over grazed grasslands. Hwange's existence was threatened. Wildlife authorities intervened, culling at least 5000 elephant to bring the population down to between 12 000 and 15 000. 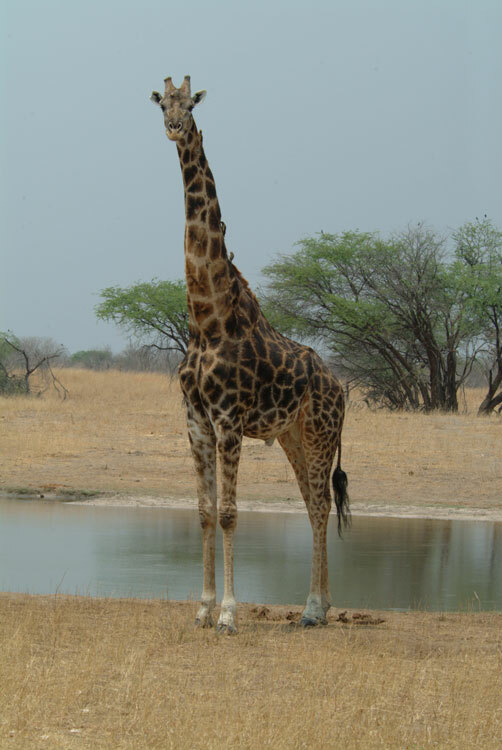 The maximum that Hwange National Park can support without damage. In 2010, the numbers had again grown considerably and it is then estimated that the elephant population was somewhere between 30 000 to 40 000 animals. In mid 2017, the numbers had risen to 45 000. This is critical and damage to the environment is certain as the park is only able to sustain 10 000 African elephants. It remains to be seen what the Zimbabwe National Parks does to alleviate this inevitable problem. 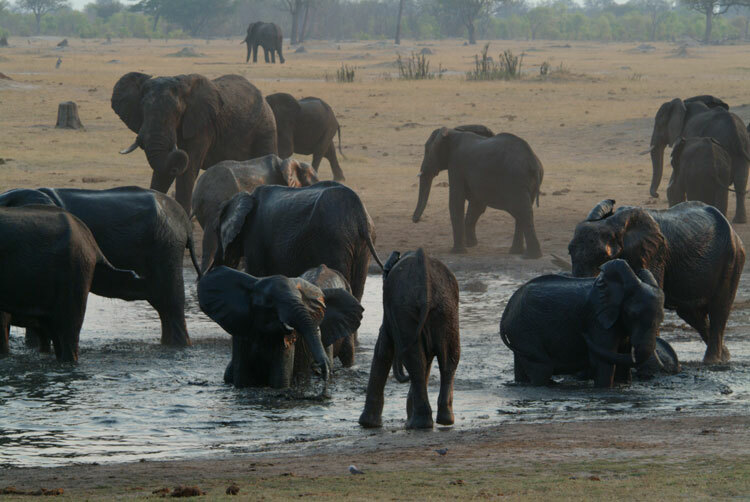 Water remains the single most important management factor in Hwange's continued existence - absolutely vital to the survival of what is perhaps Africa's single largest concentration of elephant. The constant maintenance of the artificial but natural looking water pans, complete with resident hippo's and crocodile, has been a major factor sustaining this ecological treasury. Without them, Hwange National Park would return to the empty wasteland it once was, animals would die in their thousands. Government funding has long since run out for this maintenance and the onus has now fallen upon a few individual organisations, like "Friends of Hwange" and "Save Hwange" who's efforts are to be highly commended. National parks have several good self catering camps and facilities. The 3 major National Parks camps are Main Camp, Sinamatella and Robins camp - here you will find lodges, chalets and camping. Visit the National Parks website for full details. There are also Commercial Safari Lodges. These companies offer high quality accommodation and hospitality. 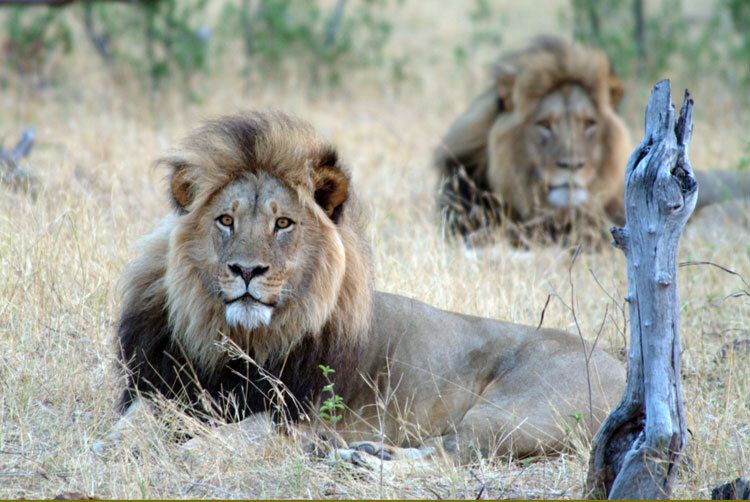 Please refer to our in-depth page on Hwange accommodation. You will also find lots of discussions on Hwange on this SA 4x4 Forum which can be useful when planning your trip. This map is available for download by simply clicking on the map. All we ask is that you Please Help to Raise Funds for Hwange National Park by making a donation through the PayPal button below. All funds go directly to the park. Thanks to those for your kind donations. See where the money has gone. As you can see I spent the money that your website kindly donated in part payment of two pumps for Hwange. I had an urgent request for a pump for Jambile and will be sending them to the Park on Saturday. Once again I thank you very much for your kind donation and hope that you agree with the way I spent it. Add Your Story about Hwange National Park. Have you been there? What did you see? Are you involved in a conservation project there? Have you been on a game count? Anything about this magnificent park... Please Share it!